CELEBRATE 4 DECADES OF FRANKE & THE KNOCKOUTS WITH FRIDAY MUSIC!!! CONTAINS ALL THREE ORIGINAL ALBUMS : "FRANKE & THE KNOCKOUTS" - "BELOW THE BELT" & "MAKIN' THE POINT"
INCLUDES THE HITS "SWEETHEART" " NEVER HAD IT BETTER" "OUTRAGEOUS" "YOU DON'T WANT ME" "WITHOUT YOU (NOT ANOTHER LONELY NIGHT" "JUST WHAT I WANT" "YOU'RE MY GIRL" " CARRIE WHY" & "SHE'S A RUNNER"
In 1980 after writing music for other artists and recording his own solo work, as well as a member of the hard rock outfit Bull Angus, Franke Previte started a great new band to kick off the new decade with Franke & The Knockouts. 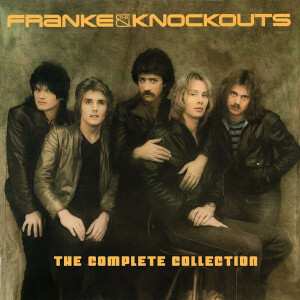 Immediately scoring a huge hit single with "Sweetheart" from their debut smash Lp "Franke & The Knockouts", the band rode a very successful run for the rest of the year with several more hits and radio friendly songs including "You're My Girl" and "She's A Runner." Their follow up smash "Below The Belt" featured more classic hit songs like "Just What I Want" the hard rockin' "Never Had It Better" as well as the blue eyed soul power ballad "Without You (Not Another Lonely Night)." Their third and final album "Makin' The Point" was filled with more powerful rock tracks like "You Don't Want Me (Like I Want You)", "Outrageous" and the soul groove of "One Good Reason." All of these albums have been out of print for years. That is until now. Friday Music is pleased to announce the all three Franke & The Knockouts album now entitled "Franke & The Knockouts - The Complete Collection." Remastered impeccably by Joe Reagoso from the authorized Franke Previte- Knockout Music tapes, this stunning 3 CD collection also features 11 bonus rare demo and unreleased recordings from Franke's personal archives ranging from the early 70's into the 90's, as well as a bonus cd featuring 6 live performances compiled over the years by Franke just for this collection. This is a "Sweetheart" of a collection for the Franke & The Knockouts fan in all of us. Perfect for your holiday listening hours and beyond. This will be one of more important reissues of the year. Enjoy!